Today Caleb goes to school for the first time. Monday we went to the uniform shop to pick out school uniforms. We bought a couple of polo shirts with the school emblem on the front. A couple of pairs of grey socks with blue stripes around the top. We bought two pairs of grey curdoroy shorts. A sweatshirt. A rain coat. A hat. And a backpack that makes him look like a Sherpa ready to climb Mount Everest. Since the uniform shop was little more than a walk-in-closet and a cash register, Caleb and Elise had gone out to play in the school grounds. Emerging from the shop (about $250 lighter and that did not include the winter uniform) I found them sitting side by side, Caleb intently watching a group of children playing tag. "I'm thinking about how I can make friends with those kids over there." The kids were clearly engrossed in their game, all knew one another, and Caleb in contrast looked so alone. I nearly cried. When I began to offer a suggestion, he said. "But, I'm a bit shy." 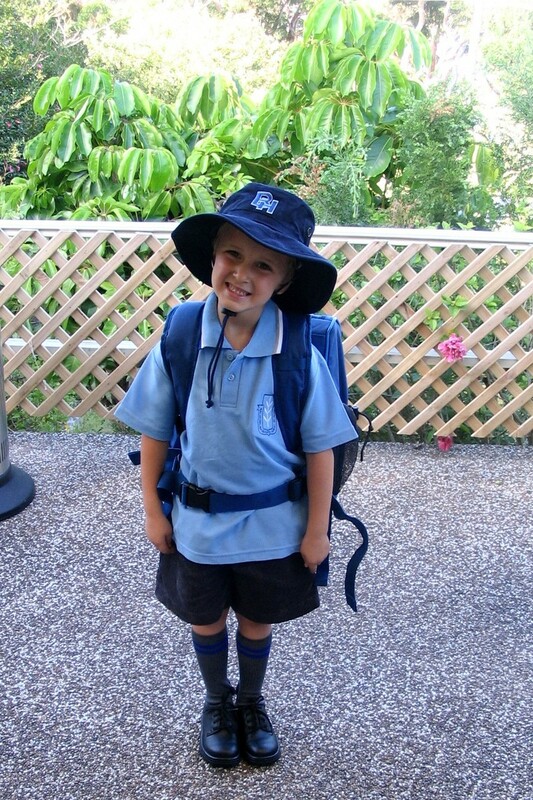 Up until this point, I'd not been the least bit apprehensive about Caleb's starting school. But now that the moment is drawing closer, I'm realizing how much our lives will change. In the past, we've made plans without a thought of a school calendar. But now our holidays will be dictated by it. * I watched Elise follow Caleb around the school grounds yesterday. And I thought again about how much she would miss him. When Caleb is the knight, she's the dragon (so much for the princess dress she got for Christmas.) And while I will not miss the bickering that does occur at our house over McDonald's toys, I will miss the sound of weapons fire as Caleb and Elise take on the "baddies" with their swords and whatever will suffice for a gun. For the past couple of days we have been playing school. He's the student, I'm the teacher. I wanted to go to the award winning playground we recently found. Caleb wanted to stay at home in our unairconditioned house and play school. I wanted to walk down to the little beach by our house. Caleb had rather practice his letters. He's been calling me ma'am for three days because we won't know who his teacher is until we arrive today. If I respond to him in a tone of voice that does not sound "teachery" Caleb reminds me, "Mom, your the teacher. Remember?" Yesterday Caleb and Elise and I went to morning tea at the park to meet with about 50 other kids that will be starting school tomorrow. They played games and had relay races. One of the women mentioned that they played games at school, so we came home and walked around the front yard carrying around eggs with soup spoons. Note: Important to boil the eggs for kindy egg and spoon races. I think I hear Caleb getting up. He's putting on his uniform. We still have two and a half hours before school begins. Eric is on business in Chicago. Since he has been away two big BIG BIG changes have taken place. Elise lost her last pacifier. The one she pined for in the dark whenever it fell out of the crib at night. The one she would call out for from the back seat of the car when the long travel became too much for a poor two year old soul to bear. The one that would lull her back to sleep (or at least keep her quiet for another half hour) when the 5:00 a.m. sun poured through the slats of the blinds in her bedroom window. When hurt, she'd wipe her tear and snot stained cheeks on my shirt and with the same voice as one stranded in the desert might say, "water, water," she'd say, "pacifier, pacifier." It was her comfort when life overwhelmed her, when it terrorized her, when it was cruel, and when life seemed to lull she'd placidly twirl it around in her mouth --The oral equivalent of twiddling her thumbs. The paci has been her constant companion. And that was our life up until a week ago. We'd come to Australia with four paci's. And one by one they'd all disappeared. I'd informed her that before I'd allow her to drive a car she'd have to give up the paci. I'd also informed her I was no longer shelling out the big bucks for a pacifier. She would only take the most expensive brand and then only the clear silicone ones. No latex! We dearly missed the pacifier. For the first couple of days after giving it up I thought I might begin an addiction of some sorts. The pacifier had pacified both child and mother in the past and I missed it dearly. But now it has been a week and it looks like the pacifier days are behind us. Elise hasn't asked for it. And except for being a bit fussier when put down for nap and bedtime she's no worse the wear. My saving grace when Eric travels is the knowledge that I can put Elise in her crib, shut the door to her room, and though she might let loose a cry that could be confused with that of a dying howler monkey, she really is okay. But yesterday I put Elise in her crib, told her to have sweet dreams and then went to the kitchen to snag a snack other than carrots or apples. Around the corner in the living room I could here Caleb doing his spot on imitation of Elise. But as I munched on the chocolate that I keep hidden underneath the celery in the crisper, so I don't have to share it with my kids (tell me I'm not the only one who does this) I realized the imitation was a little too good. Elise had scaled the crib walls and was now dancing on the couch. She smiled at me quite proud of her new accomplishment. Then she let out a cackle. Then she danced some more. And here we've crossed two milestones just mere moments apart. No more pacifier, no more crib. And I am out of chocolate.